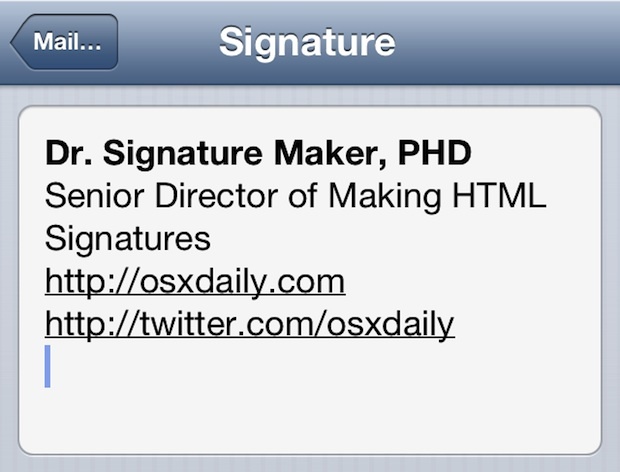 Tired of the “Sent from my iPhone / iPad” default signature of Mail app in iOS, and want to replace it with something fancier, like a fully functional HTML signature with clickable URLs and some rich styling? 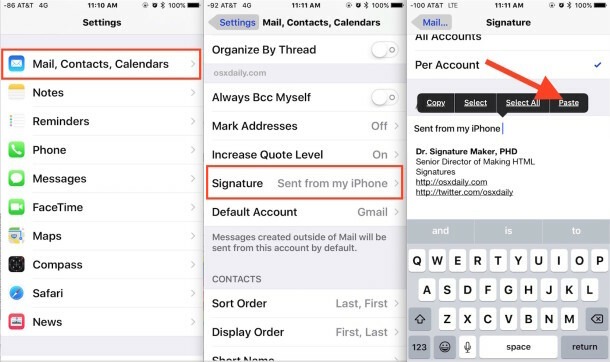 There are a variety of ways to accomplish this, but by far the fastest way to get an HTML signature in iOS is to just use an existing HTML signature, or to quickly craft one in a webmail client with HTML tools. Both will keep you from having to fumble around with HTML syntax or bother with any third party apps, and as you’ll see, they’re both pretty similar. 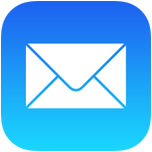 This trick works the same regardless of the iOS version, and regardless of the origin webmail client, whether it’s Gmail, Hotmail, Yahoo Mail, Outlook, the only requirement is that you have the HTML rich emails and the accompanying toolbar enabled. That is always on by default unless you’re using low-bandwidth mode, so it shouldn’t be a problem to figure it out. This secondary approach still uses copy & paste, and it’s extremely simple for those who already have an existing HTML signature setup through a work email or otherwise, be it an old signature made in Outlook or whatever else your primary desktop mail client is. Another simple method is to use the iCloud based iWork web app, but as of now that’s for developers only so it’s less relevant for wider use for the time being. 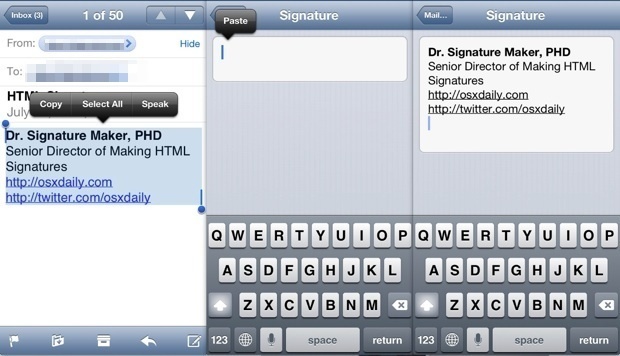 Again, there are other ways to craft stylized and clickable HTML signatures for use with the iOS Mail client, but the rest of them often require using basic HTML, or using third party apps, both of which are kind of a hassle and just annoying when compared to the easy methods offered here. This is useful enough and asked about enough that it probably should have been included in the best-of Mail app tips post, but it’s better to cover it somewhere than nowhere. This works, but the font is not the same. Found the answer to my previous post. After pasting the signature, shake the phone and select Undo. Does this work in iPad? Jeff, the shake to undo was an awesome find. Did exactly what I was looking for. Thanks for that.